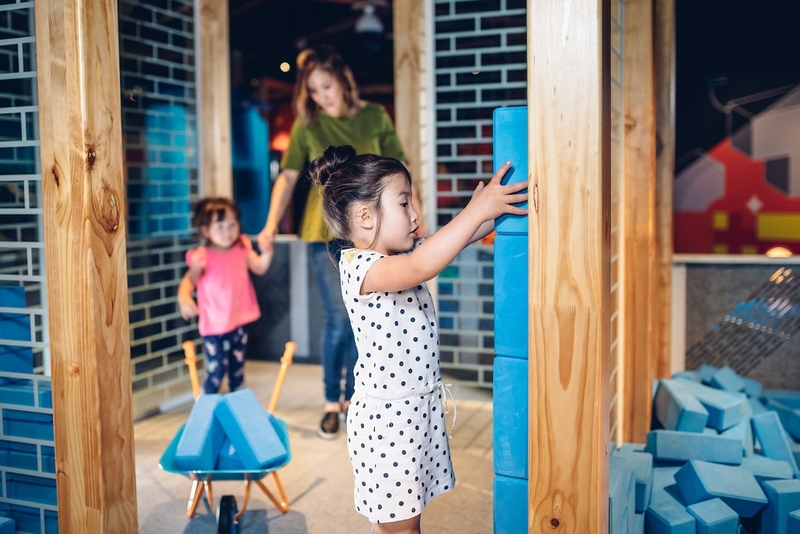 A popular and recognised process for early childhood is “learn through play” and this concept builds the foundation for the new experience available at Scienceworks. Ground Up is about building big ideas, together, for babies to 5 year-olds. It’s engaging and preparing a new generation for a future more reliant on STEM skills for problem solving and investigating. There is an emphasis on collaboration. Kids can get to work (and play!) together to solve, move through, build and discover new things around them. By using gender neutral colours throughout and removing all screens, the space allows young children to open their minds and explore without those outside influences. 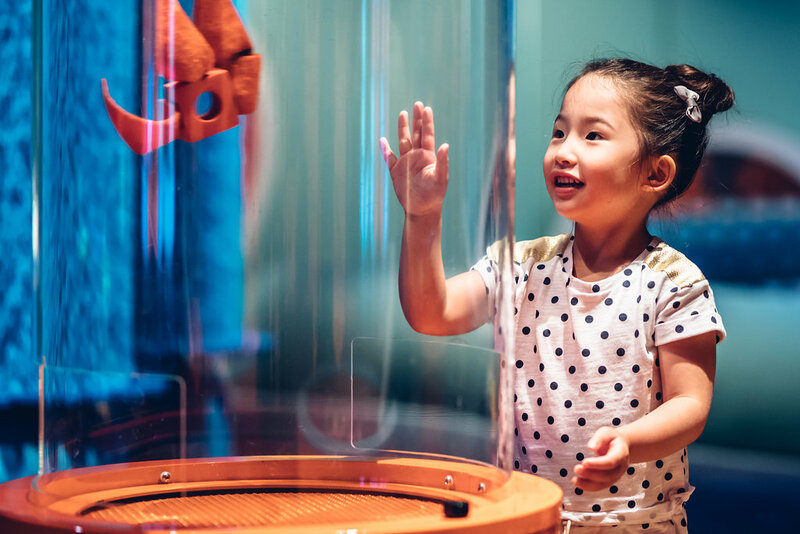 Museums Victoria believes it’s important for children to begin building skills for foundational science, technology, engineering and math from a very early age. Therefor, as soon as children enter this space they are engaged and thrilled by the creative, colourful and imaginative space. Who knew learning could be so fun? A giant Kinetic Sculpture introduces the concept of working machines to young minds. A space where kids can touch and experiment with their surroundings, by use of simple machines and real materials. They are able to create their own fun, and learn along the way. Self-exploration and development of problem-solving skills is encouraged through the entire exhibition. It also highlights that there is no ‘right’ way of doing something. Each of the three activity zones within Ground Up prompt children to develop particular skills based on their stage of development. An enclosed baby space for investigating how different materials move. Babies and crawlers can inspect nooks, mirrors, climb mounds and watch overhead light displays. Here, toddlers to 3 year-olds can test and tinker through foundational coding and create their own contraptions to watch fly up, up and away in giant wind tubes. And is that a giant wall of endless light switches to turn on and off? This is toddler heaven! It’s not just limitless entertainment keeping kids enthralled. These innovative activities allow young minds to develop unique skills such as deductive thinking, cause and effect and pattern making. Here, kids use gears to activate a giant blue car wash. They learn that small movements can have a large and visible effect on the space around them. A building section has kids working in an assembly line setting up foam bricks using a conveyor belt, pulley-systems and wheelbarrows. This is an active space designed for 3 to 5 year-olds where children must work together, using communication to solve problems and achieve results. There’s also a large climbing challenge for those keen monkeys which includes an interactive ball run. This new permanent exhibition was developed with the help of over 5,000 children and adults, including childhood education specialists, additional needs experts, teachers and visitors to the Museum. Read more about Scienceworks’ new exhibit for teenagers Beyond Perception.